A quick 3 day trip to Paris, a couple of weeks on the Costa del Sol, a skiing holiday or a shopping trip to New York, when it comes to travel the options are endless. Our travel insurance policies for couples have therefore been designed with flexibility in mind so that no matter what the destination, duration or activity, you will always have a choice of cover to protect your interests and those of your travelling companions. Our approach has always been to offer the traveller the choice when it comes to travel insurance. Following a simple quote stage where we determine your needs, the policy options are laid out on screen in such a way that you can easily see what is covered and more importantly whats not covered under each policy. Customers who are interested in the most cost effective options have the ability to further reduce the policy prices by by removing elements such as baggage and cancellation cover and increasing the excesses. 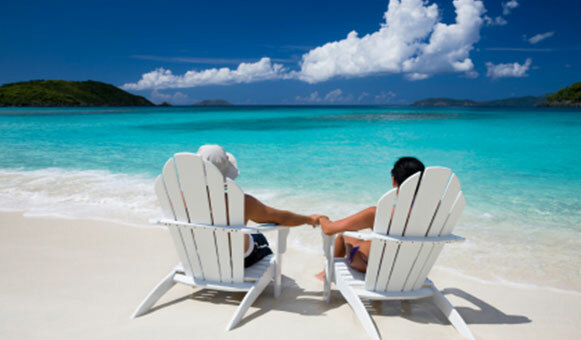 Comprehensive travel insurance for couples covers for insurable events that may occur before or during travel, such as trip cancellation/interruption, medical expenses for injury or illness, theft of valuables, baggage damage and more. The cost of travel insurance is based on the type of cover requested, the age of the insured, the destination of travel, length of stay, type of activities covered and whether you have any pre-existing medical conditions. We have a wide range of available travel insurance policies available to suit all needs. What about the EHIC, Isn't that enough? The European Health Insurance Card or EHIC is designed to ensure that you will receive free or reduced cost emergency medical treatment in any of the EU member countries - plus Switzerland - and is available for those aged 16 and over free of charge. It is important to remember that the EHIC is for emergency hospital visits only and will not entitle you to any other form of treatment. It will also not cover the cost of emergency repatriation to the UK if needed and will not pay for any of the other benefits associated with a travel insurance policy including baggage, cancellation, personal liability cover, etc. To find out more about the European Health Insurance Card, please click here. (1) The British Foreign and Commonwealth Office (FCO).